Bootstrap offers a pagination component that looks simple yet the large block is hard to miss, easily scalable, and provides large click areas. This is a static component and there are few dynamic jQuery plugins available that simplifies the rendering of Bootstrap Pagination. 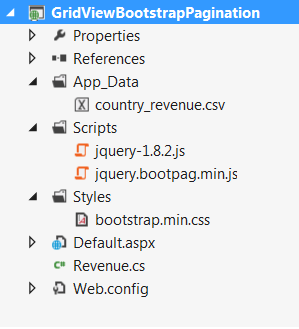 In this post, I am going to use BootPag jQuery plugin and implement server side paging in ASP.Net GridView. jQuery Bootpag is an enhanced bootstrap pagination plugin. It is very easy to set up – we only have to pass a callback function and listen for the page event. Inside that function, we can update the GridView with the content by making ajax calls to server side web method. 2. Let us use a csv file with some sample data to populate gridview. I have created a csv file and stored it in Project/App_Data folder. We need a model class to represent the columns in the csv file (country, revenue, salemanager, year). I am implementing server side pagination in this example and at any point of time I am returning only 5 records (maximum records per page) from the server. Now let us take a closer look at the jQuery script. Initially when the page loads, an ajax call will be made to server side method called, GetTotalPageCount - this method fetches the total number of records contained in the csv file once when the page initially loads. This is required because we have to pass total record count as input for bootpag plugin to generate list of paging controls based on it(option : total). GridView is loaded with the first five records on page load from the server side and on every click on the pager control, ajax call is made to the server side method called, GetGridData with the current page number as parameter - this method is responsible for fetching records from csv file based on the current page number. Note that GridView has a pager template in which a div with id "page-selection" is placed. Bootpag plugin generates list of paging controls inside this div on page load. That is all! Now run the project and view "Default.aspx" in browser to see the gridview working with Bootstrap Pagination component. 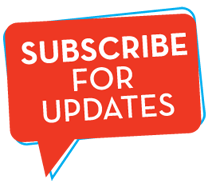 Please leave your comments and queries about this post in the comment sections in order for me to improve my writing skills and to showcase more useful posts.Thanks for reading!! how its work when there is 6 data and i want to show 4 per page?? I just addded a extra coulomb, but it doesnt show it on gridview? Is there somewhere I forgot to change? Nevermind, found it :) Great tutorial though! How would I use a SQL datasource with this? What about your example would be different? good article but can not validate any control on page as Webmethod static method not allowing to access any control of page. how to use sql server data with your examlpe.. code plz..